Many believe that the only difference in nutritional needs between a large or small breed dogs is the amount of the various nutrients in their diet. Unfortunately, this is not the case and could lead to unintended malnutrition in your four legged friend, or worse, cause them to be overfed which leads to too much weight gain and skeletal problems. It’s important to note that there are further nutritional differences between puppies, full grown dogs and senior pets within each breed, and if you are unsure of what these needs are, you can speak to one of our TipTop dog food experts. So what are the nutritional requirements of the various breeds? One of the reasons why there is a difference in nutritional needs is the growth rate of small and large breeds. Small breeds develop much faster than larger breeds; larger breeds can only be seen as fully grown from 2+ years of age. Larger breeds are prone to orthopaedic diseases such as hip dysplasia. Therefore it’s very important to ensure that they have diets that contain less calcium and phosphorous and are also less energy dense. Smaller breeds have very fast metabolisms and therefor need larger amounts of calories more frequently. If they don’t, they could easily develop hypoglycaemia which can lead to seizures, lethargy, muscle spasms and, in extreme cases, even death. It’s very important for dogs to stimulate their jaws (hence the reason they are often caught chewing household items). Their food plays a big part in this. Smaller breeds need smaller kibble and larger breeds need larger kibble. This is solely because of the difference in jaw sizes and if the kibble is too small or too large, the jaw will not be stimulated and can actually lead to injuries. 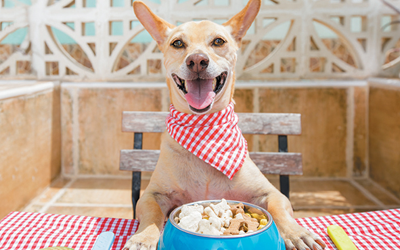 If you have decided that your top dog need a top breed specific diet and you want to switch over to a different brand, it’s important to remember to do it gradually since a sudden change in diet can upset your pets stomach. TipTop dog food is specifically developed using unique formulas in order for your dog to get the optimum nutritional value from its diet – whether a big or small breed. For further enquiries or to purchase a pack for your top dog contact us here.